Each one of us must have thought about living on a tree house as a kid – some had it just as a passing thought while some fantasized the scene for long. What if we tell you that this childhood fantasy of yours can come true? Thanks to Indian travel and tourism, it gives us the opportunity to live the moment in real-time comfort and luxury at the best tree houses resorts in India. Whether you are planning a romantic getaway with your partner or it’s a family trip with your little ones, tree house experience is the best. Go through this list to choose the best tree house resort in India. Situated in Dandeli, the Hornbill Tree House Resort is famous for its setting close to the beautiful Kali River in the state of Karnataka. You will get to enjoy various adventure activities like water rafting, rappelling, coracle ride and not just this, you can also relax and allure the surrounding while bird watching. In the tree house, you will have a well-decorated, spacious and luxurious room with top-notch amenities. Plan any kind of holiday and Jaipur is a place to suffice all your desires. Want to stay in a tree house while taking out time to explore the royal Pink City? Book the popular Tree House Resort with star-level services, luxurious feel and bewildering amenities. The Tree House Hideaway in Bhandavgarh has a signature style coming from the setting or location. Situated close to the Tiger Reserve of Bhandavgarh, the tree house welcomes adventure lovers, wildlife admirers and aspiring or professional photographers. The tree house resort has only 5 tree houses offering the splendid view of the magnificent fort, lush green jungle and the serene river. What more can you expect from a tree house than an awe-striking view of the valley? Manali is one of the best travel destinations in the country and living in this tree house resort will make your trip all the more memorable and exciting. You could clearly see the snow-capped Himalayas during winters. If you are planning for an autumn or spring trip, you can have fruits like plums, apples and oranges for free. The service and view of the resort is exceptional. The Vyithiri Tree Resort in Kerala is one of the most attractive tree houses in the state welcoming a large number of honeymooners and couples on a romantic getaway every year. You will love the stay amidst the lush and thick forest canopy. Wouldn’t it feel great living so close to nature and admiring the surrounding beauty of the dew drop-filled green forests all while your stay. How about merging two exotic kinds of holidays? Imagine staying close to the backwaters of Keralawhile staying in a tree house. Yes, it is possible with the exceptionally beautiful Chunnambar Beach Backwaters Resort. You can have fun indulging into water sports and enjoy solitude at the tree house. 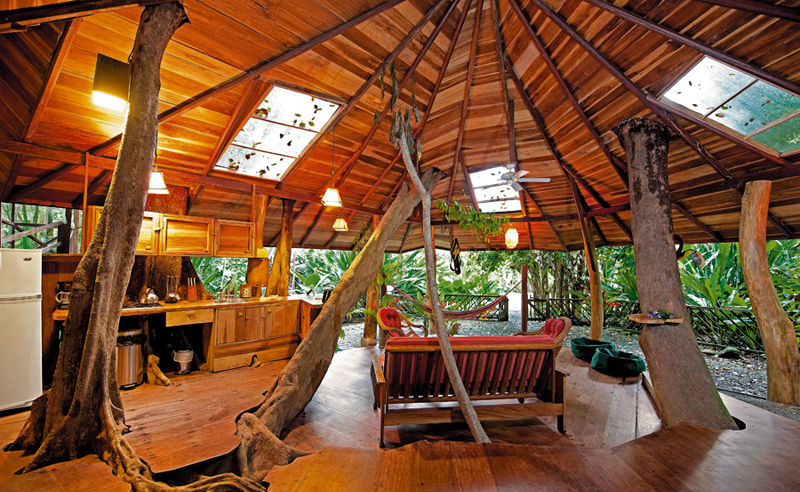 Far away from commercialization, his tree house is no less than a retreat. At a distance of short drive from the busy urban Mumbai is the Jambulne Island. Out of the top ten tree house resorts in India on this list, this is one of the most luxurious, comfortable and beautiful tree houses. Machan serves to be one of the best biological hot spots across the world offering tree houses on awesomely unique trees. Staying at a height of 35-40ft from ground is a surreal experience indeed and the addition of an environment like Machan makes it worth experiencing. Not just this, you can also indulge in various adventure activities such as trekking, picnicking, camping, etc. Athirapally, One of the best tourist destinations in the state of Kerala is known for sightseeing, Ayurveda, boating and several others. Out of these many attractions, tree houses are the most fascinating. This boutique tree house is set away from the regular chaos of life in the city and offers guaranteed luxury and comfort. The majestic view of the Athirapally falls from the tree house will leave you spellbound. Of the various tree houses in Kerala, Vanya Tree House is one of the favorites of tourists especially couples for its perfect location. It is a 3 hour journey from airport to the beautiful tree house. The journey itself is so amazing – the breathtaking views of the Periyar River, the lush green Idduki Hills and the popular Periyar National Park. As soon as you enter the area of tropical rain forests, there it is! The authentic tree houses offered with top-notch amenities and surreal environment. Staying in a tree house built on the hilly slopes is no less than a hypnotic experience. This is what the Nature Zone Resort of Munnar does to you. You will be all mesmerized by the splendid views of the white low floating clouds. If you are a wildlife lover, you will find it exotic to spot mouse deer, barking deer, wild elephants, Nilgiri woof Pigeon and some others while on a hiking trip from your fantastic tree house. Want to see your dream of living in a tree house come true? Better book cheap flight tickets to any of the above places at Indian Eagle at the earliest.